It is the round shaped single seeds which are available in two different forms. It is a nutrient dense with high protein content. The walnuts require essential storage conditions in order to stop the fungal infections. The nutritional content of the walnut includes water, protein, fat, carbohydrates and dietary fiber. The walnut is also used for the salad dressings and can also be used for the frying. The various products of walnut such as walnut cake, walnut chip and coffee. Additionally, the non-food applications of the walnut are folk medicine, cleaning of the aviation parts and dyes. The consumption of walnut has various health benefits. The global walnut market is witnessing robust growth on the account of rising disposable income of the population coupled with the increasing consumption of the walnut. Additionally, the changing lifestyle is also increasing the consumption of the walnut across the globe. The growing awareness about the benefits associated with the consumption of walnut is anticipated to drive the growth of the global walnut market during the forecast period. 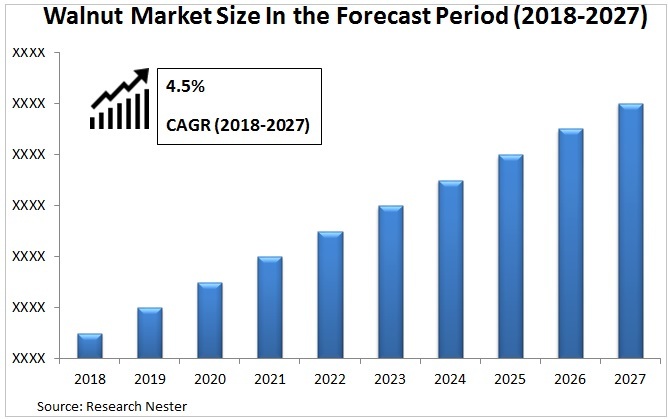 user industries is expected to be the major factor driving the growth of the sub-segment. On the basis of end-use, it is sub-segmented into pharmaceuticals, personal care & cosmetics, household and food industry. The various health benefits associated with the walnut is anticipated to increase the demand for the walnut across the globe. The walnut is highly consumed dry fruits after almonds and cashews. The growing awareness among the consumer regarding the various health benefits associated with the walnuts is increasing the demand for the walnut across the globe. 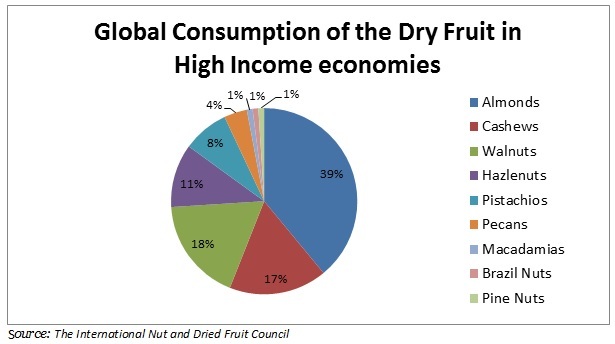 The growing disposable income of the population across the globe is anticipated to increase the spending towards dry fruit. This in turn is anticipated to boost the growth of the overall walnut market during the forecast period. The high cost associated with the walnut is anticipated to restrain the growth of the overall walnut market during the forecast period. Additionally the cultivation problems associated with the walnut is also expected to hinder market growth during the forecast period. On the basis of regional analysis, global walnut market is segmented into five major regions including North America, Europe, Asia Pacific, Latin America and Middle East & Africa region. Asia-Pacific is anticipated to lead the overall market during the forecast period. The high cultivation of the walnut in the region leads to the increased consumption of the walnut .This in turn is anticipated to boost the growth of the overall walnut market. North America is anticipated to showcase vibrant growth during the forecast period. The increasing disposable income of the population in the region coupled with the high export of the walnut from the region is anticipated to be the major reason for the growth of the overall walnut market during the forecast period.